I acquired an advanced reader copy of Delirium through Netgalley back in December. When I read the book a few months ago, I didn't feel like I could write a review that would do it justice. Then a few weeks ago, someone at Harper Audio offered me the chance to listen to the audiobook. It was then that I knew this was the time to start attempting to put my thoughts about this book into a cohesive message. Since the popularity of The Hunger Games, the dystopian genre has been so over-saturated that, at first glance, this book might just get dismissed as just another author trying to cash in on a trend. However, what sustains this book and sets it apart from all the other dystopian novels is in the beauty of Oliver's simple, no-nonsense prose. And yet, despite its simplicity, it is also lyrical and poetic. Even further to Oliver's credit is her ability to subtly weave a developing and evolving protagonist through a suspenseful, page-turning plot. Lena's character begins the novel having accepted the previously stated Orwell-esque mantra. However, as the story progresses, you slowly but surely see that lie begin to unravel as everything she thought she once believed comes crashing down around her. In regards to the audio presentation, Sarah Drew did a phenomenal job at interpreting this story. Her emotions were perfectly on point and they were so believable that I almost felt like SHE was feeling those emotions as she was reading the story. When Lena cried, I could almost see the tears running down the narrator's face. I highly recommend the audiobook if you're a fan of listening to books, but, like me, get frustrated with indifferent, apathetic, or just plain ill-suited narrators. Without revealing any spoilers, I will say that upon first reading, I was perplexed, almost angered by the ending. But the second time around, I understood why the book had to end the way it did. I would love to say more, but I don't want to give anything away. All I can say is that if you're a fan of dystopia and you haven't read this book yet... what are you waiting for? I read Delirium a while ago and was really impressed by it. When most people pull the "love is to be avoided" thing, they normally just leave that at romantic love, but Lauren Oliver went a step beyond and even included the love between friends and families. That was interesting. Also, the ending I felt was pretty powerful, and actually had me shedding a few tears at the sacrifice. But I'm sentimental that way sometimes! Just found your blog today. 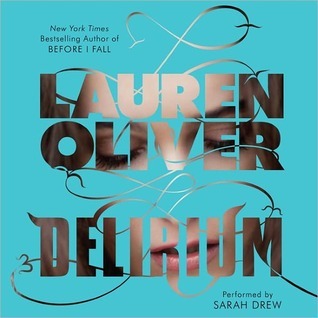 Wanted to let you know I linked to your audiobook review of Delirium. I agree that narrator Sarah Drew does a great job. I think I liked it better as an audio than I would have as a book!